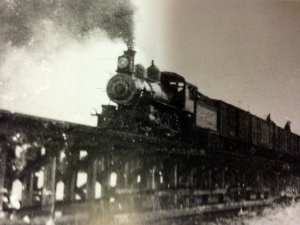 Did you know that Henry Flagler’s East Coast Railroad was originally named “Jacksonville, St Augustine and Indian River Railroad? 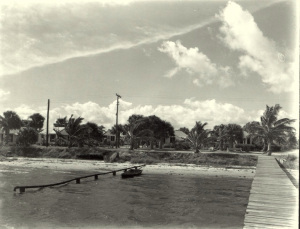 ” I didn’t until I reread my mother’s “Stuart on the St Lucie” book. The name was changed on September 9, 1895 to the infamous and famous East Coast Railroad. 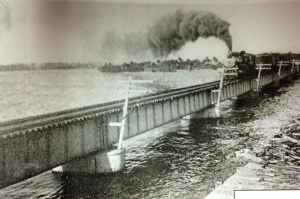 The train did and does, massively affect our Indian River Lagoon Region. 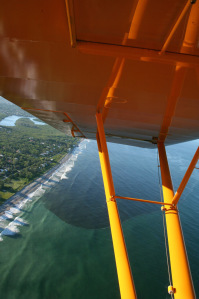 Today, I will take you on an air tour, hopefully one of the last of this year’s rainy season. In Florida, rainy season corresponds with hurricane season that lasts June through November. Nonetheless, typically the rains start to wind down towards the end of October. The Army Corp of Engineers has not released from Lake Okeechobee this years so it has given us an opportunity to see what the runoff in our area is “in and of itself.” I refuse to use the words “local runoff” because the St Lucie River and Indian River Lagoon’s runoff is over 50% of what is was before the Water/Flood Control Districts and the ACOE created since the 1920s in order to drain the land for development and mostly agriculture. i love you so much! 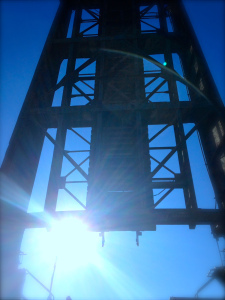 The truth is when I moved up here the water was fabulous and there had not been discharges for a long time. The mothers day before the discharges i was at boy scout island playing the water. when i spoke to you how many years had it been with out discharges. 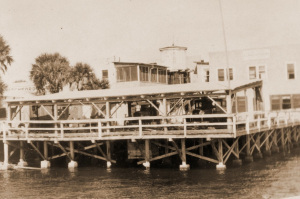 There also a reporter from the Palm Beach Post who wrote an article and she got all her facts very wrong saying there were only 100 people at the locks when scott came and that after that we liked scott. It was a crazy article and honestly after years of the Palm Beach Post not even commenting on this issue they wrote an article and got it wrong. Thank you stepping in. We are all in this together. I know reporters have to do their job. Tyler is an extraordinary journalist and we are blessed to have him. The Palm Beach post could take some lessons from the Stuart News. I tell all the politicians to read “The Swamp” know your history. We’re a tough crowd. We live breath and eat this issue. 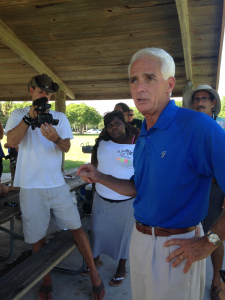 As you probably saw in the paper, Charlie Crist, Democratic gubernatorial candidate for Florida, visited Stuart on Wednesday, October 3, 2014. Very exciting! I have been waiting for the governor’s race to crank up and for the St Lucie River/Indian River Lagoon to be in the spotlight as it should be. In my dream of dreams Governor Scott and Charlie Crist would come to Stuart debate. For now, I will be satisfied that this year both have visited and spoken and are aware of health issues facing the St Lucie River/Indian River Lagoon. I had seen Charlie Crist speak before at the Florida League of Cites, in Hollywood, but it was fun to see “the man, the myth,” our former governor, up close, face to face, along with his beautiful wife Carol. An open field exposes the land’s black gold. Pahokee area heading to Clewiston. 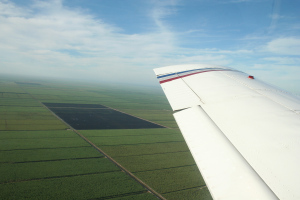 On Sunday, a beautiful day, Dr Shaun Engebretsen flew my husband and I, in his Piper Lance, to get a “higher view” of the proposed Sugar Hill Sector Plan around the area of Clewiston in Hendry County and to get a shot of its heart, Airglades Airport. 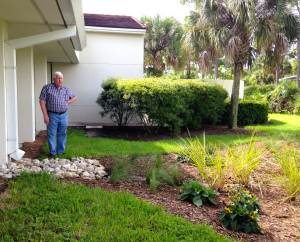 What Are “Rain Gardens” and How Can They Help Our Indian River Lagoon? a wonderful idea to help runoff from going into the river. Recently, I kept hearing about “rain gardens,” and how they could be used in the Town of Sewall’s Point to help the Indian River Lagoon. I kept nodding my head, but I really had no idea what they were. A “garden for rain” obviously, but nonetheless, no image would crystallize in my mind. After a field trip with UF IFAS extension office representative, (http://martin.ifas.ufl.edu), Mr Fred Burkey, I now know, so today, I am going to share with you about a very cool, beautiful, and useful thing Martin County and others are promoting to help our ailing St Lucie River/Indian River Lagoon and waterways across our nation. 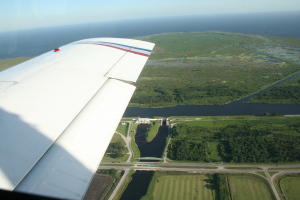 Aerial Photos: SugarHill-Sector Lands, Restoration, Indian River Lagoon.